Wednesday 3rd Nov 7.30pm at Wayland House, evening talk by Dr Andrew Rogerson on 'Recording Archaeological Finds in Norfolk'. Andrew runs The Identification and Recording Service at Gressenhall, which exists to record all archaeological finds made by members of the public in Norfolk. They rely on the public to bring us what they find, to increase everyone’s knowledge of Norfolk’s past. Thousands objects are taken to them every year, mostly from areas where there has been no archaeological excavation. 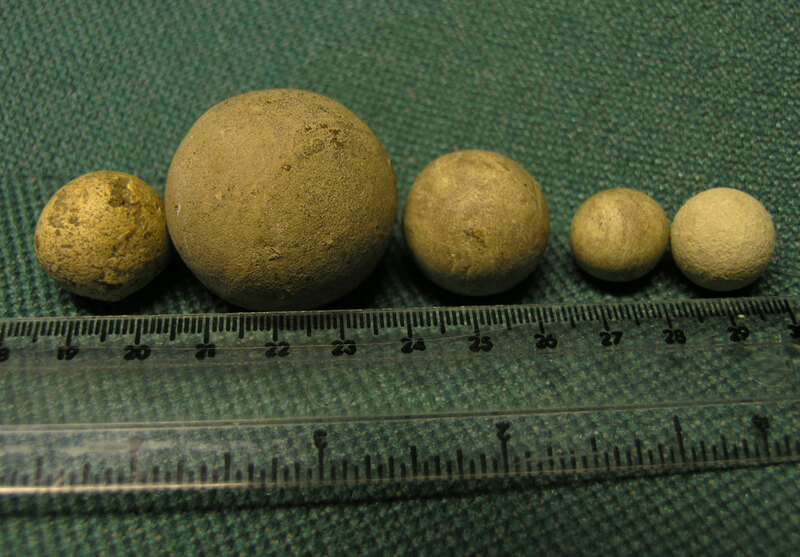 Many of these objects are brought to the surface by agricultural machinery, which destroys their archaeological context. They record the objects for posterity on the Norfolk Historic Environment Record, which is also based at Gressenhall. 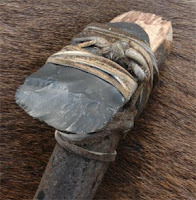 They range from Palaeolithic flint tools (up to half a million years old) to 18th-century lead cloth seals. They record flint, pottery, bricks, tiles and objects made of glass, bone and metal, and the finder receives a copy of all the information that is recorded. This field trip is now fully booked all those who applied up till 1pm on 27th Oct have a place. We will be meeting in Gt Cressingham church porch at 10.30am. Please bring your wellies it could be very wet underfoot. 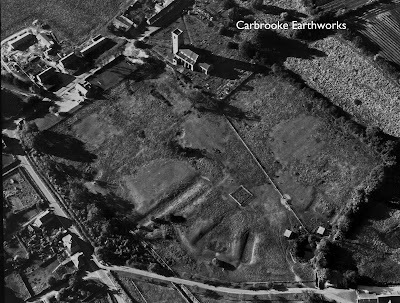 Wayland Earthworks Field Day on Sat 30th Oct, with Brian Cushion surveyor and author of 'Earthworks of Norfolk. The field day will visit sites at Gt Cressingham and Carbrooke. It will start at 10.30 at Gt. Cressingham looking at earthworks relating to the medieval village of Great Cressingham. Medieval fishponds, Moats, tofts, house platforms and hollow ways are all visible as earthworks. Stopping for lunch at the Windmill Inn at 12.30pm then on to earthworks at Carbrooke, a medieval site of the preceptory of the Knights of St John (a military monastic order similar to the Knights Templar). The site is represented by a series of well-preserved earthworks. Wayland in Image and Sound - A Special Project Event on Sat. 16th Oct, 10am - 5pm at Queens Hall, Watton. This special event is a celebration of the Wayland Area in Image and Sound. We have films and videos of the area that will be showing throughout the day. Several filmed are by members of the project produced on a recent film workshop run with the BBC. There will also be photographs taken by the projects photographic group who have been working through the summer on their collections, including images taken from the same spot as early photographs to show how the landscape has changed. Local History and Archive Groups are also going to be showing there latest work, including the Saham Toney History Group's Illustrated Time-Line. Ashill Archive Group will be showing a range of films and photographs of the village. 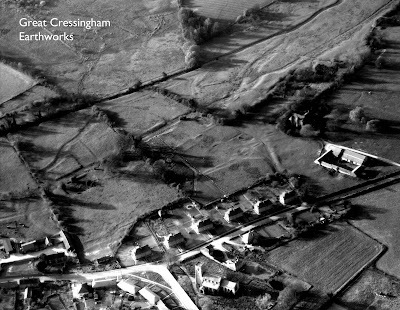 There will be an exhibition of old photographs of Great Cressingham recently gathered together for the first time. 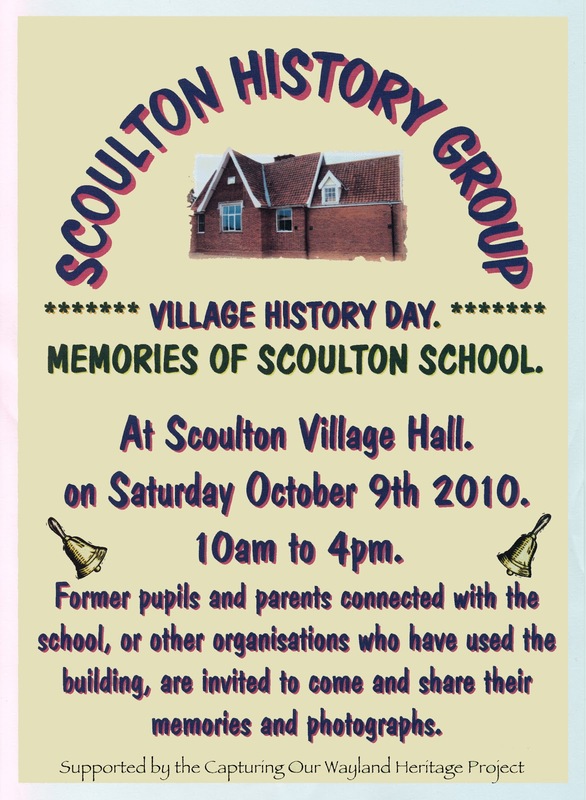 The Scoulton History Group will have a display of images of school life in the village, you may be able to help them name some of the people in their photographs. 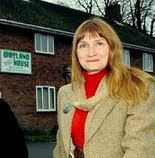 Other local films include a remarkable film following the history of a medieval brass in Merton Church by Helen Riley, and a film about the Merton Estate shot in the 1970s. From the Griston Archive Group we have a video about the church - clock, bells and repairs to organ. It also includes visits by the American servicemen who were based in Griston and views from the top of the tower. They also have a CD of Ken Godfreys talk about the Americans in the village during war. There will be lots to see and entrance is free. If any one would like to exhibit on the day it is not to late, please contact Sue White on 01953 880216 or 07526 909714. 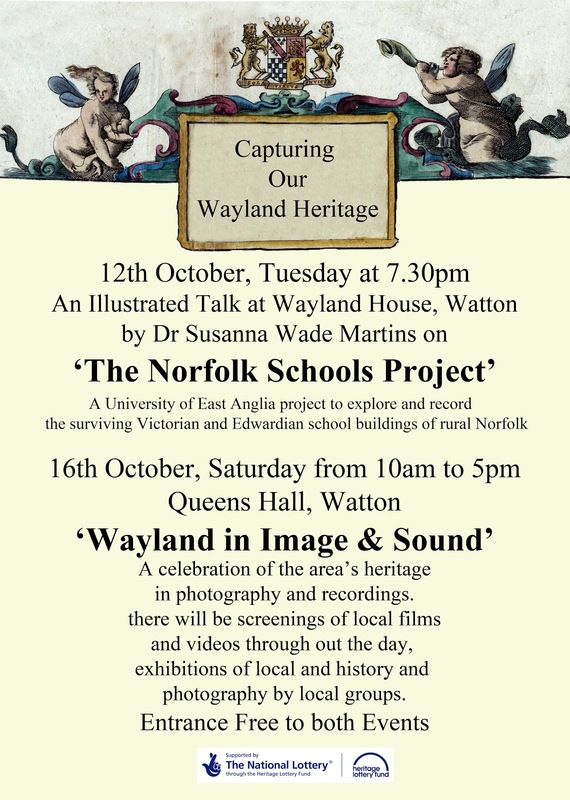 Reminder that this Tuesday 12th Oct there is an evening talk 'The Norfolk Rural Schools Project' Wayland House, 7.30pm. 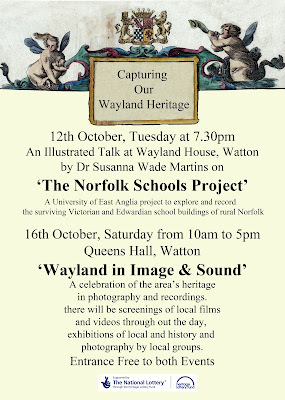 This Tuesday 12th Oct, 7.30pm an illustrated evening talk by Dr Susanna Wade Martins on the 'Norfolk Rural Schools Project, Wayland House, High Street, Watton. Entrance free. It is a University of East Anglia project to explore and record the surviving Victorian and Edwardian school buildings of rural Norfolk. 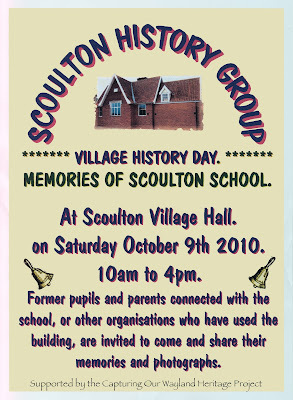 The Village History Day exhibition is being held in Scoulton Village Hall from 10am to 4pm, entrance is free. Former pupils and parents connected with the school, or other organisations who have used the building, are invited to come and share their memories and photographs.